The heat will certainly be on this winter. With winter storms hitting many parts of the country early in the winter season, furnaces are plugging away, causing heating bills across the country to increase. According to the U.S. Department of Energy (DOE), the typical U.S. family spends at least $2,200 per year on energy bills – with nearly half of that going toward heating and cooling. To help homeowners combat the cost of heating a home during the winter months, Valerie Mastalka, a home heating and energy efficiency expert at Lennox, suggests looking at areas around the house to keep the warm air in and the cool air out. Repair the roof. It’s important to inspect the roof to make sure shingles are in place to prevent water from seeping inside the house. Mastalka emphasizes that it can be dangerous to be on the roof once cold weather ensues, so check it out before the onset of winter. If large gaps are found, hire a professional roofing company to repair the problem areas. In addition, avoid covering roof vents or turbines for the winter as this will prevent air from circulating properly through the attic and will reduce the overall energy efficiency of the home. Dodge the drafts. Air leaks caused by cracks or holes around windows and doors can enable warm indoor air to escape and cold outside air to seep in, preventing you from maintaining a consistent indoor temperature. To identify air leaks in outside-facing walls or doors, try holding a candle near suspect areas to reveal drafts and then seal leaks with caulk or weather stripping. Mind the (chimney) gaps. To prevent warm indoor air from escaping the home, Mastalka reminds homeowners to keep fireplace dampers closed when not in use; however, always make sure the damper is fully opened before starting a fire. Look for any gaps in the mortar between bricks, as they can allow moisture to build up and compromise the roof’s integrity. Also check for soot accumulation in the chimney, and if needed, hire a professional chimney sweep to perform a thorough cleaning before the start of winter. Don’t forget the furnace. 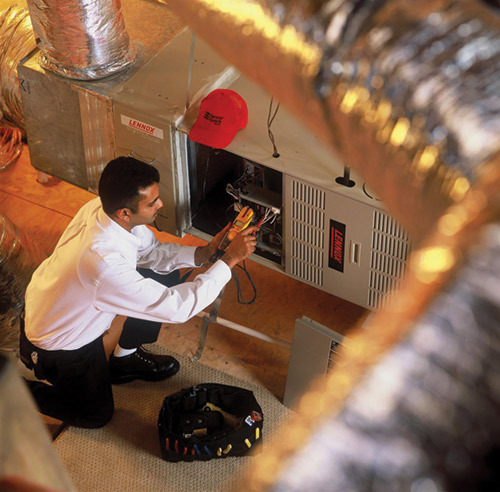 Mastalka recommends having your furnace thoroughly inspected by a certified technician. In addition, changing furnace air filters at least once a month and vacuuming the heater vents in the living areas of the home will help keep your heating system clean and running efficiently. If your furnace is more than 15 years old, Lennox recommends upgrading to a high efficiency system, such as one of its variable-speed furnaces, which can save hundreds of dollars on utility costs. Attend to the attic. The attic is one of the biggest culprits when it comes to heat loss. If you are experiencing high heating bills and having difficulty keeping your home warm, it could be time to add additional insulation to the attic. Mastalka says that attic insulation should be approximately five inches deep. Homeowners can hire a professional or add insulation themselves with portable blowing units available for rental at home improvement stores. By making a few minor adjustments around the home, homeowners can help lessen safety concerns and reduce the amount of wasted energy – all while staying comfortable during the chilly season. To learn more about home energy efficiency and how you can save money on utility bills during the winter months, visit www.lennox.com/lennox-life or www.facebook.com/Lennox.